We introduce the concept of a photonic Dirac monopole, appropriate for photonic crystals, metamaterials and 2D materials, by utilizing the Dirac-Maxwell correspondence. We start by exploring the vacuum where the reciprocal momentum space of both Maxwell’s equations and the massless Dirac equation (Weyl equation) possess a magnetic monopole. The critical distinction is the nature of magnetic monopole charges, which are integer valued for photons but half-integer for electrons. This inherent difference is directly tied to the spin and ultimately connects to the bosonic or fermionic behavior. We also show the presence of photonic Dirac strings, which are line singularities in the underlying Berry gauge potential. While the results in vacuum are intuitively expected, our central result is the application of this topological Dirac-Maxwell correspondence to 2D photonic (bosonic) materials, as opposed to conventional electronic (fermionic) materials. Intriguingly, within dispersive matter, the presence of photonic Dirac monopoles is captured by nonlocal quantum Hall conductivity–i.e., a spatiotemporally dispersive gyroelectric constant. For both 2D photonic and electronic media, the nontrivial topological phases emerge in the context of massive particles with broken time-reversal symmetry. However, the bulk dynamics of these bosonic and fermionic Chern insulators are characterized by spin-1 and spin-½ skyrmions in momentum space, which have fundamentally different interpretations. This is exemplified by their contrasting spin-1 and spin-½ helically quantized edge states. Our work sheds light on the recently proposed quantum gyroelectric phase of matter and the essential role of photon spin quantization in topological bosonic phases. 22 February 2019: A typographical correction was made to the title. P. Dirac, “Quantised singularities in the electromagnetic field,” Proc. Royal Soc. Lond. A: Math. Phys. Eng. Sci. 133, 60–72 (1931). J. Preskill, “Magnetic monopoles,” Annu. Rev. Nucl. Part. Sci. 34, 461–530 (1984). D. J. Thouless, M. Kohmoto, M. P. Nightingale, and M. den Nijs, “Quantized hall conductance in a two-dimensional periodic potential,” Phys. Rev. Lett. 49, 405–408 (1982). C. L. Kane and E. J. Mele, “핑2 topological order and the quantum spin hall effect,” Phys. Rev. Lett. 95, 146802 (2005). S.-Y. Xu, I. Belopolski, N. Alidoust, M. Neupane, G. Bian, C. Zhang, R. Sankar, G. Chang, Z. Yuan, C.-C. Lee, S.-M. Huang, H. Zheng, J. Ma, D. S. Sanchez, B. Wang, A. Bansil, F. Chou, P. P. Shibayev, H. Lin, S. Jia, and M. Z. Hasan, “Discovery of a weyl fermion semimetal and topological fermi arcs,” Science 349, 613–617 (2015). R. B. Laughlin, “Quantized hall conductivity in two dimensions,” Phys. Rev. B 23, 5632–5633 (1981). K. Osterloh, M. Baig, L. Santos, P. Zoller, and M. Lewenstein, “Cold atoms in non-abelian gauge potentials: From the hofstadter “moth” to lattice gauge theory,” Phys. Rev. Lett. 95, 010403 (2005). D. J. P. Morris, D. A. Tennant, S. A. Grigera, B. Klemke, C. Castelnovo, R. Moessner, C. Czternasty, M. Meissner, K. C. Rule, J.-U. Hoffmann, K. Kiefer, S. Gerischer, D. Slobinsky, and R. S. Perry, “Dirac strings and magnetic monopoles in the spin ice dy2ti2o7,” Science 326, 411–414 (2009). S. Sugawa, F. Salces-Carcoba, A. R. Perry, Y. Yue, and I. B. Spielman, “Observation of a non-Abelian Yang Monopole: From New Chern Numbers to a Topological Transition,” arXiv:1610.06228 (2016). H. Kedia, I. Bialynicki-Birula, D. Peralta-Salas, and W. T. M. Irvine, “Tying knots in light fields,” Phys. Rev. Lett. 111, 150404 (2013). M. Stone, “Berry phase and anomalous velocity of weyl fermions and maxwell photons,” Int. J. Mod. Phys. B 30, 1550249 (2016). I. Bialynicki-Birula and Z. Bialynicka-Birula, “Uncertainty relation for photons,” Phys. Rev. Lett. 108, 140401 (2012). L. Lu, J. D. Joannopoulos, and M. Soljacic, “Topological photonics,” Nat Photon 8, 821–829 (2014). Review. M. C. Rechtsman, J. M. Zeuner, Y. Plotnik, Y. Lumer, D. Podolsky, F. Dreisow, S. Nolte, M. Segev, and A. Szameit, “Photonic floquet topological insulators,” Nature 496, 196–200 (2013). Letter. A. B. Khanikaev, S. Hossein Mousavi, W.-K. Tse, M. Kargarian, A. H. MacDonald, and G. Shvets, “Photonic topological insulators,” Nat Mater 12, 233–239 (2013). K. Ding, G. Ma, M. Xiao, Z. Q. Zhang, and C. T. Chan, “Emergence, coalescence, and topological properties of multiple exceptional points and their experimental realization,” Phys. Rev. X 6, 021007 (2016). H. Wang, L. Xu, H. Chen, and J.-H. Jiang, “Three-dimensional photonic dirac points stabilized by point group symmetry,” Phys. Rev. B 93, 235155 (2016). M. G. Silveirinha, “Chern invariants for continuous media,” Phys. Rev. B 92, 125153 (2015). S. Raghu and F. D. M. Haldane, “Analogs of quantum-hall-effect edge states in photonic crystals,” Phys. Rev. A 78, 033834 (2008). F. D. M. Haldane and S. Raghu, “Possible realization of directional optical waveguides in photonic crystals with broken time-reversal symmetry,” Phys. Rev. Lett. 100, 013904 (2008). M. Hafezi, S. Mittal, J. Fan, A. Migdall, and J. M. Taylor, “Imaging topological edge states in silicon photonics,” Nat Photon 7, 1001–1005 (2013). Article. Y. Guo, M. Xiao, and S. Fan, “Topologically protected complete polarization conversion,” Phys. Rev. Lett. 119, 167401 (2017). W. Gao, M. Lawrence, B. Yang, F. Liu, F. Fang, B. Béri, J. Li, and S. Zhang, “Topological photonic phase in chiral hyperbolic metamaterials,” Phys. Rev. Lett. 114, 037402 (2015). S. B. Glybovski, S. A. Tretyakov, P. A. Belov, Y. S. Kivshar, and C. R. Simovski, “Metasurfaces: From microwaves to visible,” Phys. Reports 634, 1–72 (2016). Metasurfaces: From microwaves to visible. 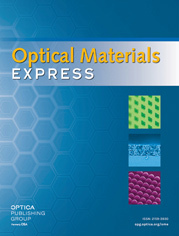 N. Papasimakis, Z. Luo, Z. X. Shen, F. D. Angelis, E. D. Fabrizio, A. E. Nikolaenko, and N. I. Zheludev, “Graphene in a photonic metamaterial,” Opt. Express 18, 8353–8359 (2010). F. D. M. Haldane, “Model for a quantum hall effect without landau levels: Condensed-matter realization of the “parity anomaly”,” Phys. Rev. Lett. 61, 2015–2018 (1988). L. Lu, Z. Wang, D. Ye, L. Ran, L. Fu, J. D. Joannopoulos, and M. Soljačić, “Experimental observation of weyl points,” Science 349, 622–624 (2015). W.-J. Chen, M. Xiao, and C. T. Chan, “Photonic crystals possessing multiple weyl points and the experimental observation of robust surface states,” Nat. Commun. 7, 13038 (2016). Article. B. Yang, Q. Guo, B. Tremain, R. Liu, L. E. Barr, Q. Yan, W. Gao, H. Liu, Y. Xiang, J. Chen, C. Fang, A. Hibbins, L. Lu, and S. Zhang, “Ideal weyl points and helicoid surface states in artificial photonic crystal structures,” Science (2018). L. Wang, S.-K. Jian, and H. Yao, “Topological photonic crystal with equifrequency weyl points,” Phys. Rev. A 93, 061801 (2016). H. Hu and C. Zhang, “Spin-1 topological monopoles in the parameter space of ultracold atoms,” Phys. Rev. A 98, 013627 (2018). T. Van Mechelen and Z. Jacob, “Quantum gyroelectric effect: Photon spin-1 quantization in continuum topological bosonic phases,” Phys. Rev. A 98, 023842 (2018). T. Van Mechelen and Z. Jacob, “Dirac-Maxwell correspondence: Spin-1 bosonic topological insulator,” arXiv:1708.08192 (2017). D. Chruscinski and A. Jamiolkowski, Geometric Phases in Classical and Quantum Mechanics, Progress in Mathematical Physics (BirkhäuserBasel, 2004). I. Bialynicki-Birula and Z. Bialynicka-Birula, “Berry’s phase in the relativistic theory of spinning particles,” Phys. Rev. D 35, 2383–2387 (1987). L.-k. Shi and J. C. W. Song, “Plasmon geometric phase and plasmon hall shift,” Phys. Rev. X 8, 021020 (2018). P. A. D. Gonçalves, L. P. Bertelsen, S. Xiao, and N. A. Mortensen, “Plasmon-exciton polaritons in two-dimensional semiconductor/metal interfaces,” Phys. Rev. B 97, 041402 (2018). S. A. R. Horsley, “Topology and the optical dirac equation,” Phys. Rev. A 98, 043837 (2018). S. M. Barnett, L. Allen, R. P. Cameron, C. R. Gilson, M. J. Padgett, F. C. Speirits, and A. M. Yao, “On the natures of the spin and orbital parts of optical angular momentum,” J. Opt. 18, 064004 (2016). O. E. Gawhary, T. Van Mechelen, and H. P. Urbach, “Role of radial charges on the angular momentum of electro-magnetic fields: Spin-3/2 light,” Phys. Rev. Lett. 121, 123202 (2018). B. Zhen, C. W. Hsu, L. Lu, A. D. Stone, and M. Soljačić, “Topological nature of optical bound states in the continuum,” Phys. Rev. Lett. 113, 257401 (2014). D. C. Marinica, A. G. Borisov, and S. V. Shabanov, “Bound states in the continuum in photonics,” Phys. Rev. Lett. 100, 183902 (2008). I. V. Lindell and A. H. Sihvola, “Realization of the pemc boundary,” IEEE Transactions on Antennas Propag. 53, 3012–3018 (2005). J. Li, C. Shen, A. Díaz-Rubio, S. A. Tretyakov, and S. A. Cummer, “Systematic design and experimental demonstration of bianisotropic metasurfaces for scattering-free manipulation of acoustic wavefronts,” Nat. Commun. 9, 1342 (2018). Y.-M. Lu and A. Vishwanath, “Theory and classification of interacting integer topological phases in two dimensions: A chern-simons approach,” Phys. Rev. B 86, 125119 (2012). T. Senthil and M. Levin, “Integer quantum hall effect for bosons,” Phys. Rev. Lett. 110, 046801 (2013). M. A. Metlitski, C. L. Kane, and M. P. A. Fisher, “Bosonic topological insulator in three dimensions and the statistical witten effect,” Phys. Rev. B 88, 035131 (2013). A. Vishwanath and T. Senthil, “Physics of three-dimensional bosonic topological insulators: Surface-deconfined criticality and quantized magnetoelectric effect,” Phys. Rev. X 3, 011016 (2013). X. Chen, Z.-X. Liu, and X.-G. Wen, “Two-dimensional symmetry-protected topological orders and their protected gapless edge excitations,” Phys. Rev. B 84, 235141 (2011). X. Chen, Z.-C. Gu, Z.-X. Liu, and X.-G. Wen, “Symmetry-protected topological orders in interacting bosonic systems,” Science 338, 1604–1606 (2012). M. Z. Hasan and C. L. Kane, “Colloquium: Topological insulators,” Rev. Mod. Phys. 82, 3045–3067 (2010). J. H. Han, Skyrmions in Condensed Matter, Springer Tracts in Modern Physics (Springer International Publishing, 2017). N. Nagaosa and Y. Tokura, “Topological properties and dynamics of magnetic skyrmions,” Nat Nano 8, 899–911 (2013). Review. S. Tsesses, E. Ostrovsky, K. Cohen, B. Gjonaj, N. Lindner, and G. Bartal, “Optical skyrmion lattice in evanescent electromagnetic fields,” Science, 2018, aau0227 (2018). I. Bialynicki-Birula and Z. Bialynicka-Birula, “The role of the riemann-silberstein vector in classical and quantum theories of electromagnetism,” J. Phys. A: Math. Theor. 46, 053001 (2013). S. M. Barnett, “Optical dirac equation,” New J. Phys. 16, 093008 (2014). S. P. Martin, “A supersymmetry primer,” Perspectives on Supersymmetry pp. 1–98 (2011). S. M. Young, S. Zaheer, J. C. Y. Teo, C. L. Kane, E. J. Mele, and A. M. Rappe, “Dirac semimetal in three dimensions,” Phys. Rev. Lett. 108, 140405 (2012). C.-H. Park and N. Marzari, “Berry phase and pseudospin winding number in bilayer graphene,” Phys. Rev. B 84, 205440 (2011). K. S. Novoselov, E. McCann, S. V. Morozov, V. I. Fal’ko, M. I. Katsnelson, U. Zeitler, D. Jiang, F. Schedin, and A. K. Geim, “Unconventional quantum hall effect and berry’s phase of 2p in bilayer graphene,” Nat. Phys. 2, 177 (2006). R. Y. Chiao and Y.-S. Wu, “Manifestations of berry’s topological phase for the photon,” Phys. Rev. Lett. 57, 933–936 (1986). T. V. Mechelen and Z. Jacob, “Universal spin-momentum locking of evanescent waves,” Optica 3, 118–126 (2016). F. Kalhor, T. Thundat, and Z. Jacob, “Universal spin-momentum locked optical forces,” Appl. Phys. Lett. 108, 061102 (2016). S. Pendharker, F. Kalhor, T. V. Mechelen, S. Jahani, N. Nazemifard, T. Thundat, and Z. Jacob, “Spin photonic forces in non-reciprocal waveguides,” Opt. Express 26, 23898–23910 (2018). K. Y. Bliokh, D. Smirnova, and F. Nori, “Quantum spin hall effect of light,” Science 348, 1448–1451 (2015). W. Pauli, “The connection between spin and statistics,” Phys. Rev. 58, 716–722 (1940). N. Regnault and T. Senthil, “Microscopic model for the boson integer quantum hall effect,” Phys. Rev. B 88, 161106 (2013). G. Jotzu, M. Messer, R. Desbuquois, M. Lebrat, T. Uehlinger, D. Greif, and T. Esslinger, “Experimental realization of the topological haldane model with ultracold fermions,” Nature 515, 237 (2014). S.-Q. Shen, W.-Y. Shan, and H.-Z. Lu, “Topological insulator and the dirac equation,” in Spin, vol. 1 (World Scientific, 2011), pp. 33–44. Z. Zhu, Y. Cheng, and U. Schwingenschlögl, “Band inversion mechanism in topological insulators: A guideline for materials design,” Phys. Rev. B 85, 235401 (2012). A. F. Shinsei Ryu, Andreas P. Schnyder, and A. W. W. Ludwig, “Topological insulators and superconductors: tenfold way and dimensional hierarchy,” New J. Phys. 12, 065010 (2010). G. V. Dunne, “Aspects of chern-simons theory,” in Aspects topologiques de la physique en basse dimension. Topological aspects of low dimensional systems, A. Comtet, T. Jolicoeur, S. Ouvry, and F. David, eds. (Springer Berlin Heidelberg, Berlin, Heidelberg, 1999), pp. 177–263. D. Boyanovsky, R. Blankenbecler, and R. Yahalom, “Physical origin of topological mass in 2 + 1 dimensions,” Nucl. Phys. B 270, 483–505 (1986). E. H. Hall, “On a new action of the magnet on electric currents,” Am. J. Math. 2, 287–292 (1879). A. Tiwari, X. Chen, K. Shiozaki, and S. Ryu, “Bosonic topological phases of matter: Bulk-boundary correspondence, symmetry protected topological invariants, and gauging,” Phys. Rev. B 97, 245133 (2018). Y. Hatsugai, “Chern number and edge states in the integer quantum hall effect,” Phys. Rev. Lett. 71, 3697–3700 (1993). J. C. Avila, H. Schulz-Baldes, and C. Villegas-Blas, “Topological Invariants of Edge States for Periodic Two-Dimensional Models,” Math. Physics, Analysis Geom. 16, 137–170 (2013). Y. Oreg, G. Refael, and F. von Oppen, “Helical liquids and majorana bound states in quantum wires,” Phys. Rev. Lett. 105, 177002 (2010). Fig. 1: (a) Linear dispersion (light cone) of the 3D massless photon and electron ω± = E± = ±k. At the origin of the momentum space k⃗ = 0 sits a magnetic monopole with quantized charge. This singularity is often called a Weyl point and is quantized to the spin of the particle Qs = s. Integer and half-integer spin quantization is connected to bosonic and fermionic statistics respectively. (b) Dirac monopoles (Berry curvature) F⃗s = ∇⃗ k × A⃗s of the massless electron Q 1 2 = 1 2 and photon Q1 = 1 in momentum space. The monopole charge acts as a source for the magnetic field ∇⃗ k · F⃗s = 4πQsδ3(k⃗) and arises due to the discontinuous behavior in the spin eigenstates. Notice that the flux through any surface enclosing the monopole is necessarily quantized Q s = ( 4 π ) − 1 ∯ F → s ⋅ d 2 k → . This monopole is accompanied by a string of singularities in the underlying gauge potential A⃗s. Any closed path around the equator of the string produces a quantized Berry phase γ s = ∮ A → s ⋅ d k → = 2 π Q s . The accumulated phase in k⃗-space is fundamentally tied to the spin of the particle ℛs(2π) = exp(iγs) = (−1)2s. Fig. 2: Spin expectation value ℳ̂z(k) as a function of k. (a) N = 0 skyrmion with no band inversion Λ0Λ2 < 0. The spin returns to initial state ℳ̂z(0) = ℳ̂z(∞) and the total winding is trivial. (b) N = 1 skyrmion with band inversion Λ0Λ2 > 0. In this case, the spin flips direction ℳ̂z(0) ≠ ℳ̂z(∞) and the total winding is nontrivial. ki labels the band inversion point where ℳ̂z(ki) = 0 passes through zero. This point must occur for the spin to flip directions and can only be removed at a topological phase transition. Fig. 3: Left: spin texture ℳ̂(k) as a function of k for trivial and nontrivial skyrmions. (a) N = 0 skyrmion with no band inversion Λ0Λ2 < 0. As an example, we have let v = 0.5, Λ0 = 4 and Λ2 = −2. Since the spin returns to initial state within the dispersion ℳ̂z(0) = ℳ̂z(∞), the total winding is trivial. (b) N = 1 skyrmion with band inversion Λ0Λ2 > 0. To demonstrate, we have let v = 0.5, Λ0 = 4 and Λ2 = 2. In this case, the spin flips direction within the dispersion ℳ̂z(0) ≠ ℳ̂z(∞) and the total winding is nontrivial. Right: spin texture ℳ̂ of the skyrmion projected on the unit sphere. As the momentum varies over all possible values, ℳ̂(k) can perform either a (c) retracted or (d) full evolution over the unit sphere. This corresponds to a total solid angle of Ω = 0 or 4π respectively. Fig. 4: Dispersion relation of the bulk and gapless edge bands (black lines) of the topologically massive 2D particles. (a) The conventional fermionic Chern insulator is characterized by a spin-½ skyrmion (Dirac equation). (b) The bosonic Chern insulator is described by a spin-1 skyrmion (Maxwell’s equations). The bulk Chern number Cs = 2QsN depends on both the magnetic charge (spin) Qs = s and the skyrmion number N ∈ 𝕑. This corresponds to integer phases for electrons C 1 2 ∈ 𝕑 but even integer phases for photons C1 ∈ 2𝕑. At low energy, a band gap is formed at E = ω = 0 by a spatially dispersive effective mass Λ(k) = Λ0 − Λ2k2. (a) For the 2D electron, this is simply the Dirac mass. (b) For the 2D photon, this mass is equivalent to a nonlocal Hall conductivity εΛ(k) = σH(k). In the presence of band inversion Λ0Λ2 > 0, there is a point where the effective mass changes sign Λ(ki) = 0, precisely at k i = Λ 0 / Λ 2 . The massless helically quantized edge states touch the bulk bands at this point. This is known as the quantum anomalous Hall effect (QAHE) for electrons and the quantum gyroelectric effect (QGEE) for photons . The flat longitudinal band ω0 = 0 is shown for completeness and represents the electrostatic limit (irrotational fields). However, this band can be removed from the spectrum by requiring that all static charges vanish. (1) 2 e Q h ∈ 핑 . (4) H 1 ( k → ) = k → ⋅ S → = k x S x + k y S y + k z S z . (5) S x = [ 0 0 0 0 0 − i 0 i 0 ] , S y = [ 0 0 i 0 0 0 − i 0 0 ] , S z = [ 0 − i 0 i 0 0 0 0 0 ] . (7) H 1 2 ( k → ) = k → ⋅ σ → = k x σ x + k y σ y + k z σ z . (8) σ x = [ 0 1 1 0 ] , σ y = [ 0 − i i 0 ] , σ z = [ 1 0 0 − 1 ] . (10) H 1 2 ψ ± = ± k ψ ± , ψ + ( k → ) = [ cos ( θ / 2 ) sin ( θ / 2 ) e i ϕ ] , ψ − ( k → ) = [ sin ( θ / 2 ) − cos ( θ / 2 ) e i ϕ ] . (11) F → 1 ± = − i ∇ → k × [ e → ± * ⋅ ( ∇ → k e → ± ) ] . (12) F → 1 2 ± = − i ∇ → k × [ ψ ± † ∇ → k ψ ± ] . (13) F → s = Q s F → . (14) F → ( k → ) = k → k 3 . (15) Q s = s .
(16) Q s = 1 4 π ∯ F → s ⋅ d 2 k → . (18) A → 1 ± = − i e → ± * ⋅ ( ∇ → k e → ± ) , A → 1 2 ± = − i ψ ± † ∇ → k ψ ± . (20) γ s = ∮ A → s ⋅ d k → = ∬ F → s ⋅ d 2 k → . (22) γ s = 2 π Q s .
(23) exp ( i γ s ) = ( − 1 ) 2 Q s .
(24) ℛ s ( 2 π ) = ( − 1 ) 2 s .
(25) ℋ 1 2 ψ = E ψ , ℋ 1 2 ( k ) = v ( k x σ x + k y σ y ) + Λ ( k ) σ z . (26) Λ ( k ) = Λ 0 − Λ 2 k 2 . (27) ℋ 1 Ψ → = ω Ψ → , ℋ 1 ( k ) = v ( k x S x + k y S y ) + Λ ( k ) S z . (28) Ψ → = 1 2 ( ε E x , ε E y , i H z ) = 1 2 ( ε E , i H z ) . (29) ε Λ ( k ) = σ H ( k ) = σ 0 − σ 2 k 2 . (30) ℋ 1 = ℳ → ⋅ S → , ℋ 1 2 = ℳ → ⋅ σ → . (31) S → ˙ = − i [ S → , ℋ 1 ] = g 1 ℳ → × S → . (32) σ → ˙ = − i [ σ → , ℋ 1 2 ] = g 1 2 ℳ → × σ → . (34) ℋ 1 e → ± = ± ℳ e → ± , ℋ 1 2 ψ ± = ± ℳ ψ ± . (37) 〈 σ z / 2 〉 ± = ψ ± † ( σ z / 2 ) ψ ± = ± Q 1 2 ℳ ^ z . (38) ℋ 1 e → 0 = 0 , e → 0 = ℳ ^ = ℳ → / ℳ . (39) ℱ 1 ± = − i ( ∂ k x e → ± * ⋅ ∂ k y e → ± − ∂ k y e → ± * ⋅ ∂ k x e → ± ) . (40) ℱ 1 2 ± = − i ( ∂ k x ψ ± † ∂ k y ψ ± − ∂ k y ψ ± † ∂ k x ψ ± ) . (41) ℱ s = Q s ℱ . (42) ℱ = ℳ ^ ⋅ ( ∂ k x ℳ ^ × ∂ k y ℳ ^ ) = F → ⋅ d 2 ℳ → . (44) N = 1 4 π ∬ ℝ 2 ℱ d k x d k y = 1 4 π ∬ ℝ 2 ℳ ^ ⋅ ( ∂ k x ℳ ^ × ∂ k y ℳ ^ ) d k x d k y , N ∈ 핑 . (45) C s = 1 2 π ∬ ℝ 2 ℱ s d k x d k y = Q s 2 π ∬ ℝ 2 ℱ d k x d k y = 2 Q s N .
(46) ℱ ( k ) = v k [ Λ ( k ) − v k Λ ′ ( k ) ] [ v 2 k 2 + Λ 2 ( k ) ] 3 / 2 = sin θ ( k ) ∂ k θ ( k ) = − ∂ k ℳ ^ z ( k ) . (47) N = 1 2 [ cos θ ( 0 ) − cos θ ( ∞ ) ] = 1 2 [ ℳ ^ z ( 0 ) − ℳ ^ z ( ∞ ) ] = 1 2 ( sgn [ Λ 0 ] + sgn [ Λ 2 ] ) . (48) Ψ → ± e ( x = 0 + ) = ψ ± e ( x = 0 + ) = 0 . (49) Ψ → ± e ( x ) = [ ε E x ε E y i H z ] ± e = Ψ 0 [ 1 0 ∓ i ] ( e − η 1 x − e − η 2 x ) . (50) ψ ± e ( x ) = ψ 0 [ 1 ± i ] ( e − η 1 x − e − η 2 x ) . (51) Λ 0 + Λ 2 ( η 2 − k y 2 ) ∓ v η = 0 . (52) η 1 , 2 ( k y ) = 1 2 | Λ 2 | [ v ± v 2 + 4 Λ 2 ( Λ 2 k y 2 − Λ 0 ) ] . (53) S y Ψ → ± e = ± Q 1 Ψ → ± e .
(55) ω ± ( k y ) = E ± ( k y ) = ± v k y , − k i < k y < k i .